This is my 5th day at La Selva Biological Reserve. I've become familiar with the buildings and ventured a bit into the jungle area. They have quite a bit of paved trails so that's been exciting. Not having to watch for mud makes viewing a lot simpler and it is raised a bit from the ground (due to the heavy rains that fall part of the year). I began with the wide concrete trails to give my eyes and brain time to learn to be alert to all movement. 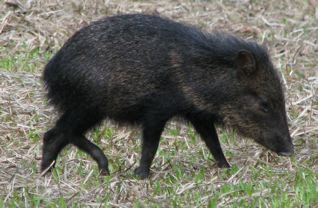 The Collared Peccaries have become near and dear friends. They enjoy the harvest from several trees that are around my building so they drop by several times a day. I've adapted pretty well to the nights here. It is so dark and for some reason I have not seen any moonlight. Mornings are very misty since it generally rains a bit at night, so it could be that at sunset the clouds move in. After dinner the walk back to my cabin is very dark, but crossing the suspension bridge is the highlight since I don't have to wonder if something will cross my path. I brought a small flashlight which is easy to carry at night, but it doesn't shine a broad beam of light. The Central American Smooth Gecko that welcomed me to my room the first evening has hung around. He had heard the story of the potato-sized hissing cockroach that two girls found in their cabin one evening. I have read that geckos like cockroaches, although it sounds like this one would be bigger than he is. However, I feel he is my Gecko Angel! He patrols the hallway outside my room at night to be sure the big bugs have no interest in visiting my room. If he misses something that would be disturbing, I'm sure one of the lizards that come under the door will be there to grab it. All in all, it's not been an issue, and that's saying something, considering I used to be terrified, petrified, horrified (get the picture) of bugs. There are 500 species of ants at La Selva and some of them have been assigned to guard my room also. 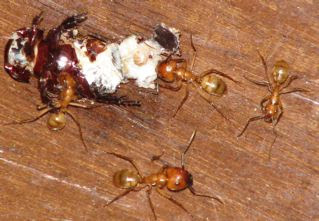 At 2 AM this morning I went to the bathroom and found these ants on duty taking apart a huge beetle. It was only 4 inches from my door. I definitely took the time to say Thank You! I have had plenty visitors that needed help finding their way back out ... or maybe they could've found their own way, but I was the bad hostess in escorting them back to the wild. The list includes spiders, beetles, ants, moths, flies, and millipedes. Moths I take in my hands with the thought of butterflies in my mind. The rest, I let crawl on the magic carpet (a booklet spread wide) so I can send them sailing into the air outside the door. Any mosquitoes are quickly exterminated with a slap! I don't find a purpose in God's green earth for such evil creatures. Speaking of moths, I found one on the ground a couple days ago. Beautiful but dead, lying there just for me to take and enjoy. The beautiful moth now sits on my desk to delight me and remind me that life is short and, for the present, to enjoy every minute here in the rainforest. It was created to be able to disguise itself. Some creatures keep from getting eaten that way. There are two big round spots that look like eyes, so anything looking down upon it would think it was some sort of animal. What detail has gone into Creation. Mosquitoes have not been a big problem until you head into the jungle. With all the bats and birds, lizards and geckos in the more open areas, they are kept under control, even though we are by the river. I always thought mosquitoes would be thick around a river, but when you've got bats with big appetites (600-1000 insects an hour) who prefer to feast in open areas such as above a river, it's the perfect picture of balance in working natural habitats. The food at the dining hall is very good and there is a lot of diversity with each day's menu. At breakfast they write on a whiteboard what will be for lunch and dinner. The vegetarian option is there also. The staff is very gracious and helpful. The internet is fairly reliable, but not convenient since I have to backpack my computer to the dining hall for wireless or visit the computer room in another direction. It is near my laundry area, so I can do laundry and work online at the same time. Sounds like city life - multitasking. I can assure you the pace is very relaxed and my mind is enjoying it. Life has a rhythm here. I rise at 5 or earlier. 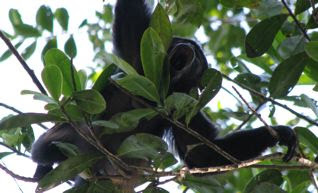 I like to be awake when the Howler Monkeys begin roaring. It's like a signal that it's time for the day to begin. Breakfast is between 6:30-8 and I go early so I can get outside to see the birds and enjoy the cool morning. The heat of the day is from about 11-3, but not as bad as I thought. In my room which is in the shaded end of the building, with the fan going, it's very comfortable. The wildlife being more active early morning and before nightfall gets me outside at those times to attempt to get a few decent photographs, although they are not the greatest time for photography. Mornings are misty and dark comes in quickly. In the first four days I've taken 1032 photos and kept only 147. Some of the keepers are on the website gallery. Some photos I do not consider good quality, but I keep them just to remind myself of the experience, such as seeing the Violaceous Trogon, Slaty-tailed Trogon and a Rufous Motmot. Such as the morning in the jungle when I came upon a troop of Collared Aracaris. It was grand to watch them with the binoculars, deep in forest at the tops of the trees where the sun produces more fruit. However, the photos get real grainy and dark when you shoot at 48x zoom on a digital. Oh well, to compensate on the same day, I saw a Basilisk Lizard close and also got a decent photo of a colorful Bananaquit which is continuously on the move in the same bushes as the hummingbirds. Since the area is very naturalized, there aren't hoards of hummingbirds like they have in some places where gardens are designed for them, but those places are easy to visit. For now, La Selva has a charm all its own, and I'm lovin' it! 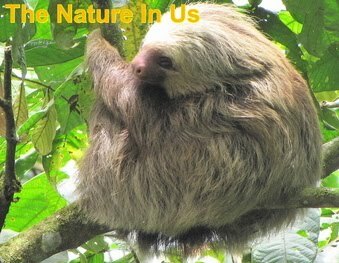 View Costa Rica photo albums.